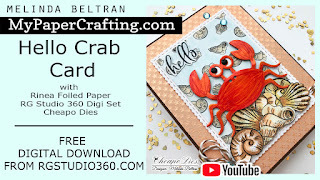 Today I am sharing another fun card I created with the Cheapo Crab die. Here’s my finished card. I started with a white cardstock base. I then cut a mat from some brown cardstock. Next I used some of the fantastic Rinea Starstruck foiled paper. For the inner mat I used the scallop stitched rectangle die and then a mat of background paper I created with the RG Studio 360 free digital download. The shells as well as the sentiment are all part of the free download. The sweet little crab is made from some Rinea Red Foiled Paper I colored it with my copic markers to give it just a little extra dimension. His little eyes are created with some Ebony Nuvo Crystal Drops. Here is one last look at my cute little card! I just love how it turned out! Here is a quick video showing how cute the little crab really is using the foiled paper. Be sure to head over to CheapoDies.com and check out all their dies at such reasonable prices!